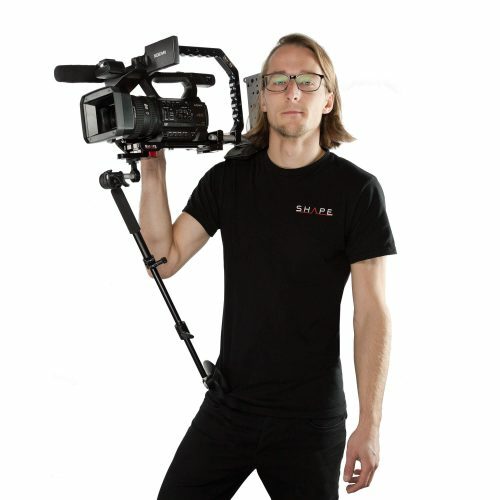 The SHAPE COMPOSITE FICTION handheld camera support, designed for DSLRs and video cameras, is the most complete SHAPE shoulder rig in the SHAPE COMPOSITE SERIES with its several accessories. It offers both inline and offset positions. It enables a fast transition from tripod to SHAPE shoulder mount in one simple click by attaching the tripod plate underneath the SHAPE PAPARAZZI RISER. Each support module can be assembled or disassembled easily for travel. No tools required. Quick and easy setup with a 4 mm Allen key (5/32 in). The SHAPE QUICK HANDLE ROD BLOC patented technology offers great precision, stability and support. Simply push and hold the red buttons individually for 360 degrees handle rotation. Once the buttons are released, SHAPE handles stay firmly in place. 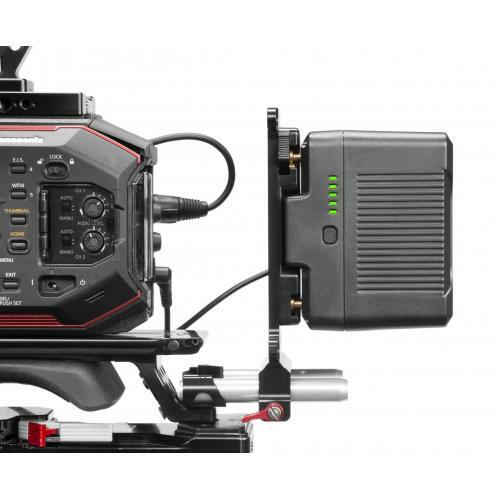 The front rods are used to attach accessories such as a matte box, a SHAPE follow focus as well as many other standard 15 mm accessories. Featuring the SHAPE TELESCOPIC SUPPORT ARM AND ROD BLOC, the SHAPE QUICK HANDLE ROD BLOC, the SHAPE LENS SUPPORT, the SHAPE PAPARAZZI II PRO, the SHAPE OFFSET RAIL BLOC, the SHAPE SLIDING ROD BLOC, the PAIR OF 15MM MALE-FEMALE RODS 6″, the SHAPE ADJUSTABLE COMPOSITE SHOULDER PAD, the SHAPE ROD BLOC, the PAIR OF 15MM MALE-FEMALE RODS 4″, the BASE SHAPE COUNTERWEIGHT ROD BLOC and the SHAPE BACK PAD, the SHAPE COMPOSITE FICTION secures the camera and accessories firmly for mobile applications.? ?? *All CNC machined, high-quality aircraft grade aluminum parts are hard anodized for a resistant finish and assembled with stainless steel screws to prevent rusting. Optional: For more comfort and stability, it is possible to add a BELT1: SHAPE BELT. You can have more set-up solutions by adding a SPIGOTM1: MALE SPIGOT (1/4-20, 3/8-16) or a SPIGOTF1: FEMALE SPIGOT (1/4-20, 3/8-16). removal of the cup attributes versatility to the SHAPE TELESCOPIC SUPPORT ARM AND ROD BLOC. By removing the cup, the arm can be used for supporting accessories such as a microphone or camera light. secured firmly in place. 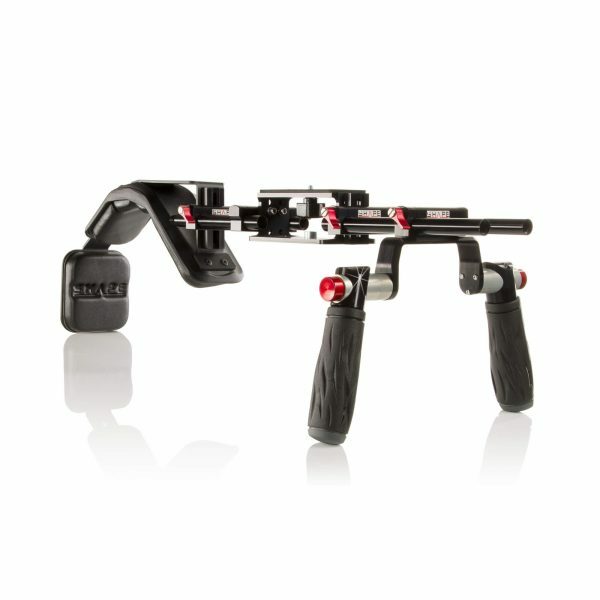 The SHAPE QUICK HANDLE ROD BLOC offers camera support for all 15 mm rods. You can achieve precise positioning by sliding the SHAPE QUICK HANDLE ROD BLOC along the rods and tightening the red knob on the SHAPE ROD BLOC. The locking mechanism is made of stainless steel for more durability. 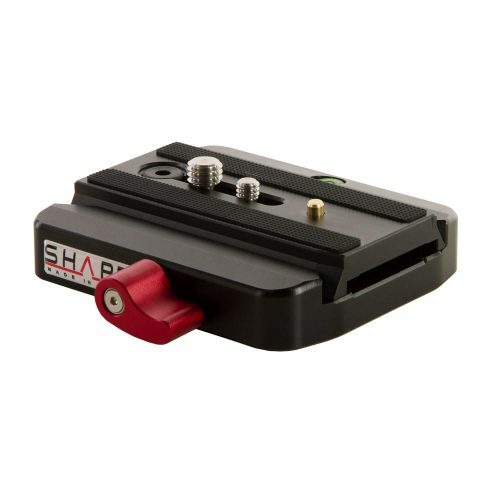 The SHAPE LENS SUPPORT includes a lens support rail and a SHAPE SLIDING ROD BLOC. 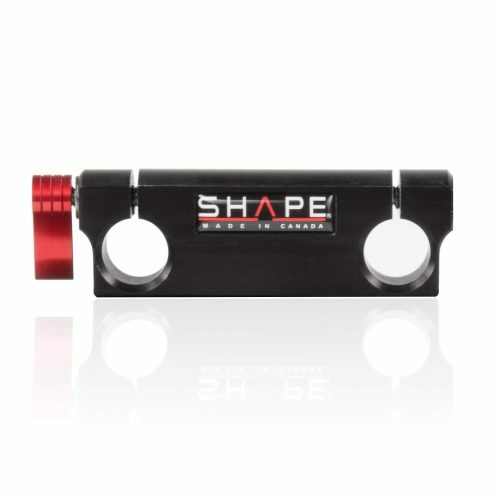 The SHAPE LENS SUPPORT has a height adjustment feature of 2.5 in. with the black knob and its support depth is 3/4 in. It holds lenses for all SHAPE camera support systems that are equipped with a 15MM ROD SYSTEM, thus less weight is put on the camera. The SHAPE LENS SUPPORT enables the lens to remain in place and avoid movements from side to side. 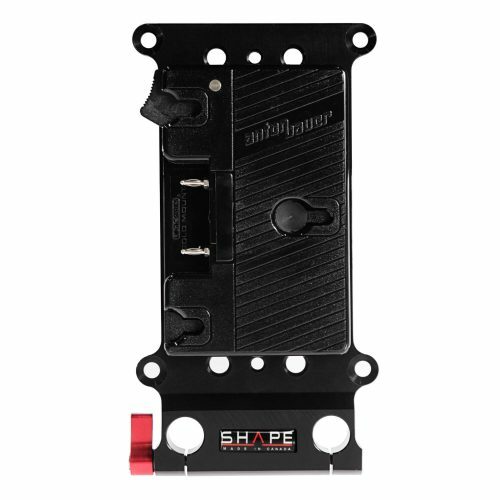 Featuring the SHAPE 15MM ROD SYSTEM PAPARAZZI RISER, the SHAPE DOUBLE C BRACKET FOR PAPARAZZI, and the SHAPE PAPARAZZI II HANDLE. The ROD2: 15MM ROD SYSTEM PAPARAZZI RISER features several threaded holes (1/4-20” and 3/8-16”) located on the base to attach a tripod plate and different types of monopods while the holes in the front and rear of the SHAPE PAPARAZZI RISER are used to attach various accessories like a SLIDING ROD BLOC. 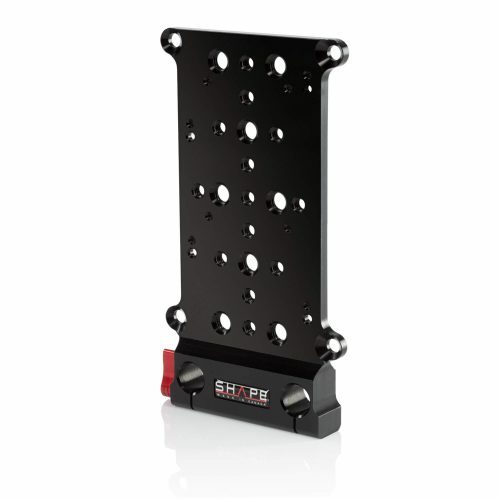 The SHAPE riser system can be used to attach a video camera or a DSLR. It provides a 2 in. high camera base and a 4 in. long slot, allowing the camera to move smoothly front and back in order to obtain the best position. A quick release plate can be attached below the SHAPE PAPARAZZI RISER for a fast transition from the camera support to a tripod. 4 mm Alley key included.? ?The PAIR OF 15MM FEMALE-FEMALE RODS (8″) located at the front are used to attach accessories such as matte boxes, 35 mm lens adapters and SHAPE follow focus mechanisms. The threads enable you to use either 4″ or 6″ rods. The BRAC1: DOUBLE C BRACKET FOR PAPARAZZI is a component of the SHAPE PAPARAZZI Series. This bracket is used to attach the SHAPE PAPARAZZI handle to the PAPARAZZI RISER. 2 stainless steel flat head socket cap screws (10 – 32 1/2), 4 stainless steel socket head cap screws (10 – 32 5/8), a 1/8″ and a 5/32″ Allen keys are included. The PA002: PAPARAZZI II HANDLE provides many threaded holes (1/4-20, 3/8-16) located on top, the sides and underneath. The handle measures 7 in. high and 9 3/4 in. wide. It is used to attach various accessories such as audio recorders, LED lights, spot lights, LCD screens, remote controls, microphones, grips, padded handles and many other accessories. The handle is also used to protect your camera and ideal for carrying the camera support. It gives you the possibility to shoot shake free videos. The PAPARAZZI II HANDLE can be attached to a tripod head using a quick release plate (not included). Optional: It is possible to add a FFCLIC: SHAPE FOLLOW FOCUS FRICTION AND GEAR CLIC, a RODSUP2: SLIDING ROD BLOC, a RAILBLOC3: OFFSET RAIL BLOC, a SPIGOTM1: MALE SPIGOT (1/4-20, 3/8-16) or a SPIGOTF1: FEMALE SPIGOT (1/4-20, 3/8-16) and many other accessories. Padded for superior comfort, the SHAPE ADJUSTABLE COMPOSITE SHOULDER PAD rests on your shoulder such that the body supports the weight of the camera and its accessories. A SHAPE SLIDING ROD BLOC and a MALE SCREW KNOB (1/4-20) are included with the shoulder pad which is powder-coated with a wrinkle finish for a professional look. Optional: It is possible to add a RODSUP1: ROD BLOC to attach more accessories on the shoulder pad. The PAIR OF 15MM MALE-FEMALE RODS (6″), located at the back, are used to attach the SHAPE ADJUSTABLE COMPOSITE SHOULDER PAD and other accessories. The threads enable you to use either 4″ or 6″ rods (1/2-13″). 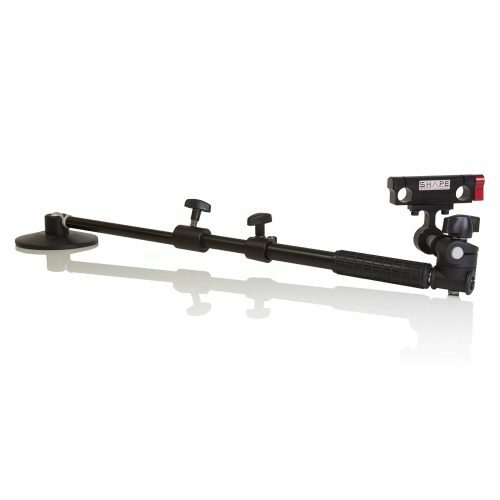 You can offset your camera to the right or the left of the SHAPE PAPARAZZI RISER by using the two black screws on the SHAPE OFFSET RAIL BLOC to create more or less distance between the camera and the shoulder mount. holes on one side which are used for screwing the SHAPE OFFSET RAIL BLOC to the front of the SHAPE PAPARAZZI RISER with a 4 mm Allen key. A second SHAPE OFFSET RAILBLOC can also be attached to the back of the SHAPE PAPARAZZI RISER. The SHAPE OFFSET RAIL BLOC is then used for attaching a SHAPE COMPOSITE SHOULDER PAD such as the SHPAD1 or the SHPAD2 by inserting rods. Black powder-coated paint for a professional look, the SHAPE BACK PAD offers the camera support superior comfort and stability. Padded on one side, the pad is attached to the SHAPE ADJUSTABLE COMPOSITE SHOULDER PAD via a MALE CAMERA SCREW KNOB (1/4-20). You can adjust the position of the SHAPE BACK PAD to suit your body type with a vertical adjustment of 2″ and a horizontal adjustment spanning of 360 degrees. The MALE SCREW KNOB (1/4-20) allows easy attachment and removal of the SHAPE BACK PAD. Optional: It is possible to attach a SHAPE BOX on the SHAPE BACK PAD using the threaded holes (1/4-20).